This article is about the circle of latitude. 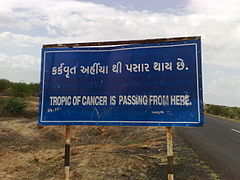 For other uses, see Tropic of Cancer (disambiguation). Carretera 83 (Vía Corta) Zaragoza-Victoria, km 27+800. 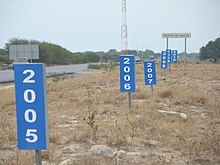 Of all crossings of the Tropic of Cancer with Mexican federal highways, this is the only place where the latitude is marked with precision and where the annual drift between the years 2005 and 2010 can be appreciated. The Tropic of Cancer, which is also referred to as the Northern Tropic, is the most northerly circle of latitude on Earth at which the Sun can be directly overhead. This occurs on the June solstice, when the Northern Hemisphere is tilted toward the Sun to its maximum extent. It is currently 23°26′12.4″ (or 23.43678°) north of the Equator. Its Southern Hemisphere counterpart, marking the most southerly position at which the Sun can be directly overhead, is the Tropic of Capricorn. These tropics are two of the five major circles of latitude that mark maps of Earth; the others being the Arctic and Antarctic Circles and the Equator. The positions of these two circles of latitude (relative to the Equator) are dictated by the tilt of Earth's axis of rotation relative to the plane of its orbit. When this line of latitude was named in the last centuries BC, the Sun was in the constellation Cancer (Latin for crab) at the June solstice, the time each year that the Sun reaches its zenith at this latitude. Due to the precession of the equinoxes, this is no longer the case; today the Sun is in Taurus at the June solstice. The word "tropic" itself comes from the Greek "trope (τροπή)", meaning turn (change of direction, or circumstances), inclination, referring to the fact that the Sun appears to "turn back" at the solstices. The Tropic of Cancer's position is not fixed, but constantly changes because of a slight wobble in the Earth's longitudinal alignment relative to its orbit around the Sun. Earth's axial tilt varies over a 41,000-year period from 22.1 to 24.5 degrees and currently resides at about 23.4 degrees. This wobble means that the Tropic of Cancer is currently drifting southward at a rate of almost half an arcsecond (0.468″) of latitude, or 15 metres, per year (it was at exactly 23° 27′N in 1917 and will be at 23° 26'N in 2045). See axial tilt and circles of latitude for further information. North of the tropic are the subtropics and the North Temperate Zone. 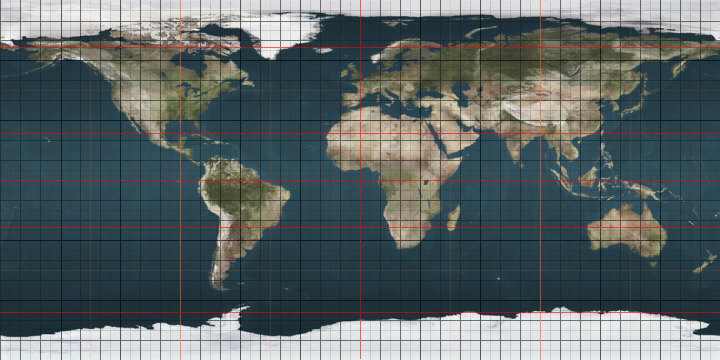 The equivalent line of latitude south of the Equator is called the Tropic of Capricorn, and the region between the two, centered on the Equator, is the tropics. There are approximately 13 hours, 35 minutes of daylight during the summer solstice. During the winter solstice, there are 10 hours, 41 minutes of daylight. Excluding cooler highland regions in China, the climate at the Tropic of Cancer is generally hot and dry except for easterly coastal areas where orographic rainfall can be very heavy, in some places reaching 4 metres (160 in) annually. Most regions on the Tropic of Cancer experience two distinct seasons: an extremely hot summer with temperatures often reaching 45 °C (113 °F) and a warm winter with maxima around 22 °C (72 °F). Much land on or near the Tropic of Cancer is part of the Sahara Desert, while to the east the climate is torrid monsoonal with a short wet season from June to September and very little rainfall for the rest of the year. The highest mountain on or adjacent to the Tropic of Cancer is Yushan in Taiwan; though it had glaciers descending as low as 2,800 metres (9,190 ft) during the Last Glacial Maximum, none survive and at present no glaciers exist within 470 kilometres (290 mi) of the Tropic of Cancer; the nearest currently surviving are the Minyong and Baishui in the Himalayas to the north and on Iztaccíhuatl to the south. According to the rules of the Fédération Aéronautique Internationale, for a flight to compete for a round-the-world speed record, it must cover a distance no less than the length of the Tropic of Cancer, cross all meridians, and end on the same airfield where it started. Length of the Tropic on 11 December 2015, at 23°26′14″N is 36,788 kilometres (22,859 mi). For an ordinary circumnavigation the rules are somewhat relaxed and the distance is set to a rounded value of at least 36,770 kilometres (22,850 mi). Road sign south of Dakhla, Western Sahara marking the Tropic of Cancer. The sign was placed by Budapest-Bamako rally participants; thus, the inscription is in English and Hungarian. ^ "PHP Science Labs". Retrieved 2014-01-01. ^ RhumbSolve online rhumb line calculator. 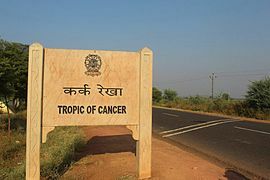 Look up tropic of cancer in Wiktionary, the free dictionary. This page was last edited on 16 April 2019, at 18:02 (UTC).